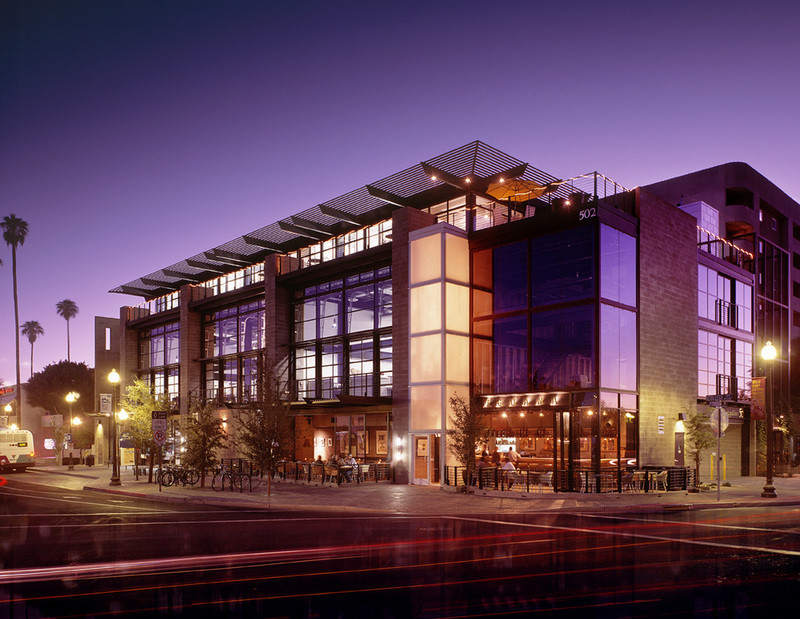 Opened in 1999, Studios 5c is a three story office building in the heart of downtown Tempe. Brick & West's Michael Rumpeltin led the design of the building as his first building project as a lead designer. Resting on the nexus between Arizona State University’s Campus, and the vibrant, walkable Mill Avenue, the project pre-dates the construction of the Valley Metro light rail and the Interim Regional Transit Center by several years. Ground floor restaurants and a 26-car parking garage are topped by high-bay creative offices on the second floor, and executive suites and a flexible gallery space on the top floor. A huge outdoor atrium doubles as the entry circulation into the second floor offices, and a third floor wrap-around roof terrace is shared event space for the entire building.